Shown here on the Rally door style in Alder. Chestnut is a Stain  nish. Shown here on the Romance door style in Cherry. Chestnut with Ebony glaze is a Stain with Glaze  nish. Shown here on the Tempe door style in Hickory. Chestnut is a Stain  nish. Shown here on the Breton door style in Cherry. Chestnut is a Stain  nish. Shown here on the Grif th door style in Maple. Chestnut is a Stain  nish. Shown here on the Pearlside door style in Rustic Alder. 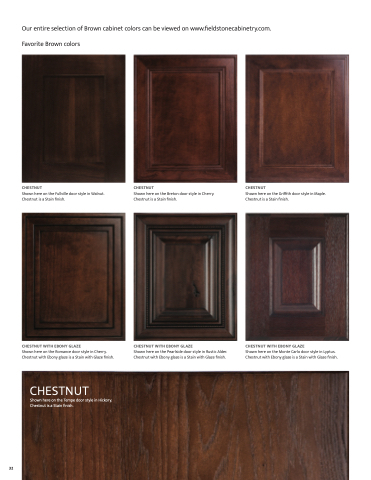 Chestnut with Ebony glaze is a Stain with Glaze  nish.